Root canal treatment (RCT) has a bad reputation but there really is nothing to worry about. The treatment involves no more discomfort than many other dental procedures, and it will often save the tooth, which is the best thing you can do for your oral health. Teeth are made up of two hard outer layers – enamel and dentine – and an inner pulp chamber, which extends via root canals to the bottom tip of the tooth. The pulp is largely made up of nerves and blood vessels. The process of removing the pulp, cleaning the canals and then filling the empty space to seal the canals is called Endodontics or Root Canal Treatment. For lots of reasons, like decay or a deteriorating old filling, the pulp becomes inflamed, which can cause pain and infection and lead to an abscess. To prevent or treat these symptoms, we can extract the tooth or carry out RCT by carefully removing the infected or inflamed pulp, cleaning the canals and destroying any remaining bacteria, and then filling the tooth with specially designed material. 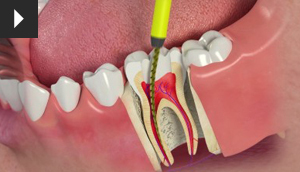 If the pulp is infected or inflamed beyond repair there are usually just the two options: we perform root canal treatment or we extract the tooth. At Lewisham Dental Practice (LDP) we believe we should always save teeth where that is possible and appropriate. Also, a replacement for a tooth is not as good as your actual tooth. Why have root canal treatment at Lewisham Dental Practice? Expertise. RCT is a complex area requiring expert knowledge and technical skill. The dentists performing your treatment have been trained up to DwSI or specialist level, and are members of the British Endodontic Society and British Restorative Dental Society. We employ techniques used and endorsed by the world’s leading endodontic centres. Pain-free treatment. At LDP we believe RCT should be a pain-free process, and to achieve this we have a wide range of anaesthetic options available, including extra-strength, needle-free injections and sedation. Magnification. Due to the very fine nature of root canals, we believe magnification is an essential part of high-quality treatment – if you cannot see the canal you cannot treat it! Therefore endodontics may be performed under magnification where necessary at LDP. Isolation. Treatment success and patient safety are priorities in all cases, but this is especially so with root canal treatment where fine instruments and the removal of harmful bacteria are involved. RCT may therefore performed under "rubber dam" isolation for your protection and to ensure treatment success. Equipment. Root canals are often very fine, curved or blocked. Negotiating these challenges requires suitable equipment, so we at LDP have invested heavily in high fracture-resistant instruments, a wide range of filing systems, including the remarkable WaveOne system, to accommodate all types of problems, and state-of-the art specialist micro-motors and ultrasonic instruments. Digital imaging. As we cannot see into the tooth, we rely heavily on x-ray images to diagnose and deliver high-quality results. At LDP we have invested in state-of-the-art digital radiography and computer software, providing instant high-definition imagery at a significantly lower dose of radiation than conventional x-rays. Availability. Teeth requiring root canal treatment are often very painful or even have swelling, and so at LDP we provide priority appointments for patients wishing to undergo private RCT with us.